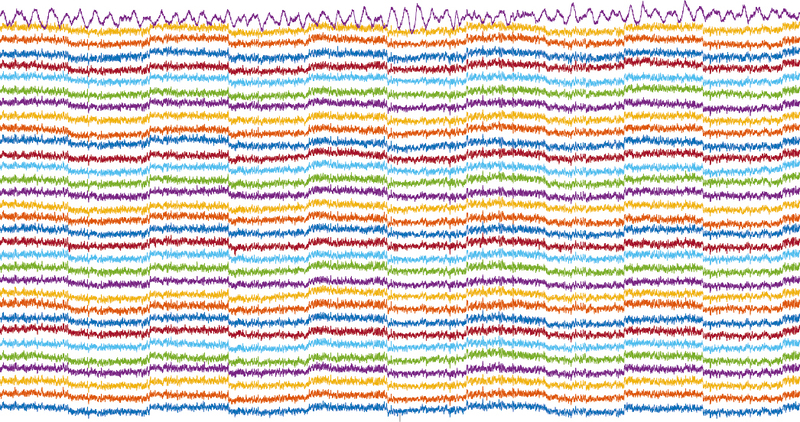 Neurologger 3 has been designed to record 16 or 32 neuronal channels having size and weight similar to the second version. However, neuronal activity usually should be correlated with animal behavior. To record vocalization of the animal, an audio cascade with a microphone capable of recording frequencies up to 100 kHz (200 kHz sampling rate) has been added. Basically, an idea to record ultrasonic vocalizations has been inherited from the previous version of the Neurologger 2B. However, contrary to the previous model, the novel version allows us to record ultrasound simultaneously with 32-channel neuronal activity. In addition, animal behavior can be tracked by an array of inertial sensors (3-D accelerometer and 3-D gyroscope) complemented by 3-D magnetic compass. All sensors can be polled with the frequencies up to 600 Hz simultaneously with acquiring of neuronal and ultrasonic data. 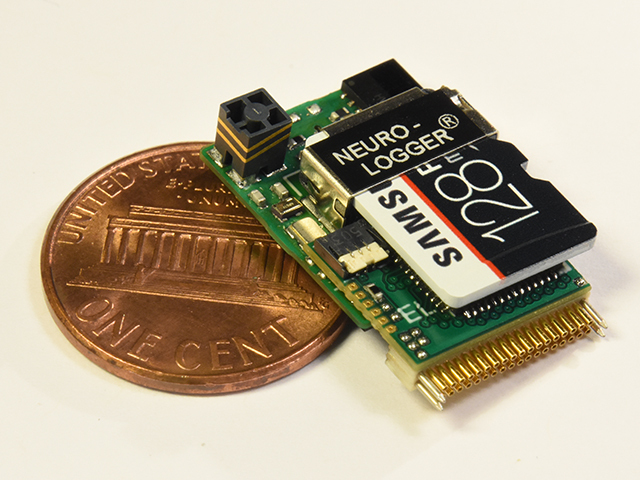 Similarly to the previous generation, Neurologger 3 has an infrared receiver for precise synchronization with external equipment with the help of infrared transmitter called Neurologger Synchronizer. This feature has been complemented by Bluetooth tranceiver for remote configuring and data access. 32 neuronal channels 20.833 kHz, sound 125 kHz, motion sensors 579 Hz. Dataflow to memory: 1.77 megabytes per second. 32 neuronal channels 15.625 kHz, sound 200 kHz, motion sensors 625 Hz. Dataflow to memory: 1.60 megabytes per second. 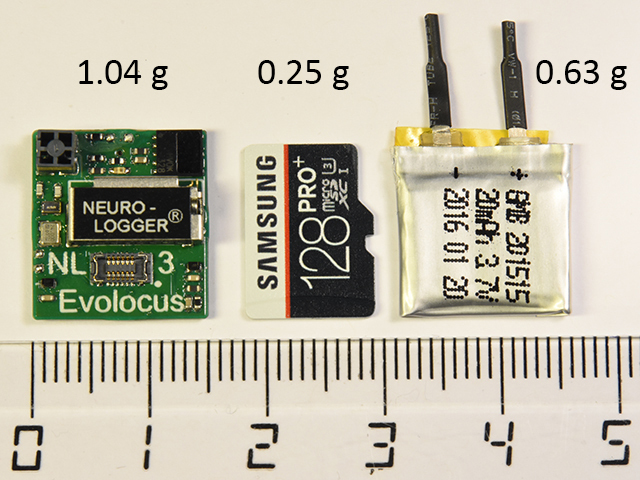 The logger consumes about 25 mA from 3.7V Lithium-polymeric battery in these modes. Weights of the logger parts are shown in the pictures on the right. 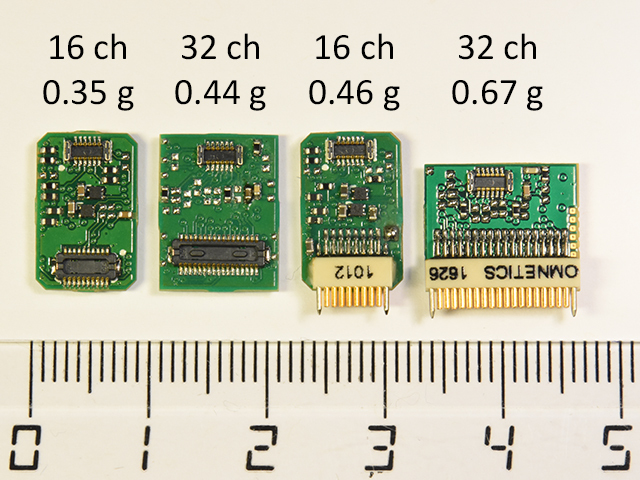 There are four types of alternative headstages: 16-channel with Hirose and Omnetics connectors, and 32-channel with Hirose or Omnetics. The scale is in centimeters. They will provide duration of neuronal recording of 15 min, 1 h 15 min and 2 h 12 min respectively in the above given modes. 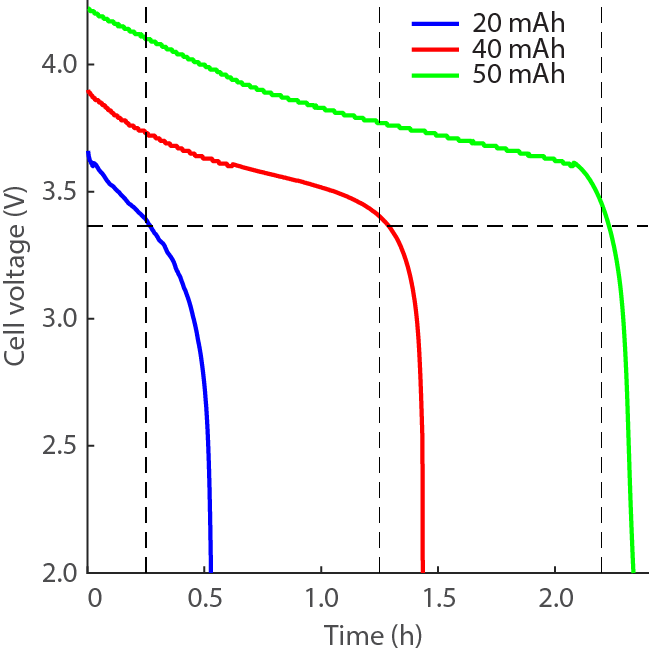 The discharge curves for the current 25 mA are given on the right. Neurologger 3 has extremely low noise and electromagnetic disturbances, see two records below, F = 1-3300 Hz. Duration of each fragment is 1 second. 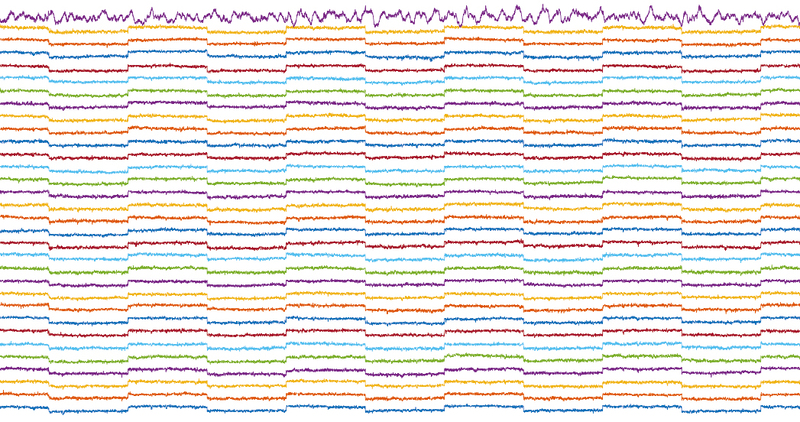 A sequence of 10 μV peak-to-peak rectangular pulses was given to the input of the logger either directly (top chart), or through 1 MΩ resistor (bottom chart). The last (top) channel was connected to the microphone to recorded environmental sounds. 10 μV step is clearly visible in both records.